It's the 1st day of Kindergarten, say a prayer for the teacher! Any teacher would sure get a kick out of this on the 1st day of school! What a great way to send your daughter in this adorable back to school shirt. 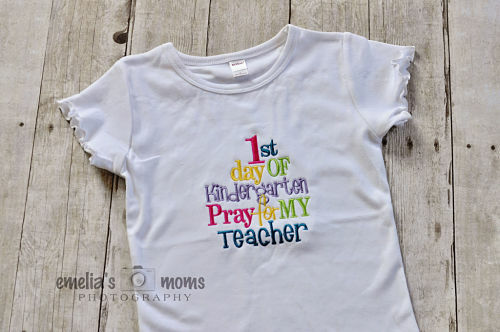 Shirt reads "1st day of Kindergarten, Pray for my teacher"
We offer shirts 2T to 12 and onesies 6 mos to 18 mos. Grade and Colors can be changed but you would have to notify us first. Please specify size and grade in the notes section. Please note if for a boy or girl. Item will ship within 7-10 business days from payment received via USPS delivery, if you are needing this faster, please contact us.